A Thought Shared ....: Quite the display.. 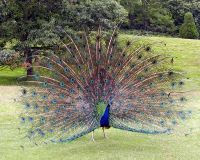 The Blue Indian Peacock is a bird that many will have seen during visits to parks, gardens and stately homes throughout the world. Their claim to fame is two-fold. The 'train' (it is not a tail) displays as a large 'fan', and the bird has a powerful, strident call. It is a native of the Indian sub-continent and Sri Lanka but has been kept as either ornamentation or food source on all continents except for Antarctica. There is also a Green Peacock, native to Burma, Thailand, Indo-China, Malaya and Java, said to have an even more colorful train than the better known Blue. Blue and Green are not the only variants. 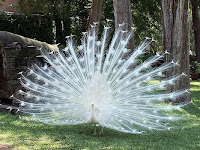 White peacocks are a mutation of the Indian Blue, and Pied Peacocks are a hybrid of the Blue and Green Peacocks. Whatever the color, one has to say that the display put on by these members of the pheasant family is a sight to behold.